Is The Skid Row Typhus Outbreak A Manufactured Crisis? Some Skid Row residents are questioning whether the declaration of a typhus outbreak in downtown L.A. is being driven more by politics than public health. 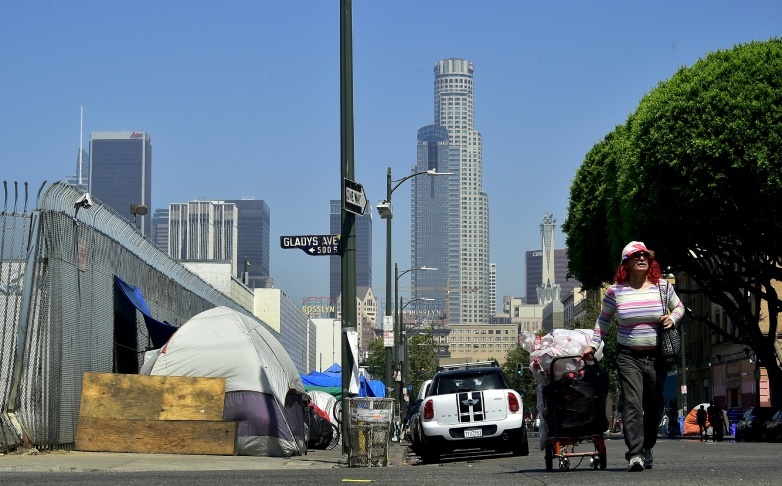 So far this year, L.A. County Department of Public Health has counted a total of 64 typhus cases, including 10 in downtown L.A. Of the downtown cases, health officials would only say that "several" were detected in people experiencing homelessness. News of the typhus outbreak dropped the day after a contentious meeting over objectively deplorable conditions on Skid Row. The timing, combined with the lack of specifics tying cases to Skid Row, concerns homeless advocates. "It's highly, highly suspicious," said "General" Jeff Page, often referred to as the de-facto Mayor of Skid Row. "I see it as a result of the business sector putting pressure on the Mayor and the City Council to do something now about Skid Row's conditions." When LAist asked whether the health department had confirmed cases originated in the so-called "typhus zone" overlaying much of Skid Row, county officials responded that they had not. READ MORE: Is L.A. Really Going To Federal Court To Argue It Can Seize And Destroy Homeless People's Property? Last year, the health department tracked a total 67 typhus cases in its jurisdiction. No outbreak was declared. According to the Centers for Disease Control, an "outbreak" is defined as an increase in the number of cases of a disease above what is normally expected in a certain area. "Typhus is endemic (commonly found) in the region," wrote a spokesperson in a statement. "Public Health is gathering additional information to determine the specific locations in downtown L.A. where the cases may have been, but that will not tell us the specific locations that contain high concentrations of infected fleas and/or infected rats, feral cats and opossums." Typhus is a bacterial infection that presents symptoms similar to a particularly nasty flu, along with a rash. The vast majority of cases are not fatal, and infection can be prevented by vaccine. WHY IS THE OUTBREAK DESIGNATION SIGNIFICANT? Two years ago, four homeless people sued the city in federal court claiming L.A. violated their Fourth and 14th Amendment rights by seizing and destroying their property. In response to that lawsuit — known as Mitchell V. Los Angeles — Judge James Otero issued a restraining order against the city preventing officials from seizing people's property on Skid Row, except in specific circumstances. One of those exceptions: If property on the sidewalk "poses an immediate threat to the health and safety of the public," as clarified by another court case, Lavan v. Los Angeles. That has homeless advocates thinking, is being in a 'typhus zone' make property a threat to health and safety? "At face value, it appears to me that there's a hidden agenda," Page said. "Sure, it's Skid Row. We're the homeless capital of America. Flip through a medical dictionary, find a disease, and say 'oh, that exists in Skid Row!' Then, all of a sudden, it's an outbreak." The boundary of the 'typhus zone' publicized by the city of Los Angeles, and reported on by the Los Angeles Times, is practically identical to the area subject to the federal restraining order on homeless encampment sweeps, defined by another court case as "Third Street to the north, Seventh Street to the south, Alameda Street to the east, and Main Street to the west." The 'typhus zone' extends an extra block west to Spring Street, instead of Main Street. With that designation, Mayor Eric Garcetti's office said the city allocated $300,000 to pay for increased sanitation services in the area over the next nine months. Page, who spearheaded the effort to incorporate a Neighborhood Council for the downtown district, doesn't buy it. To him, the establishment of a "typhus zone" is simply an excuse to "bulldoze" people's belongings from the sidewalk into garbage trucks. "The downtown business sector has a pipeline of international investments overseas waiting to come invest in downtown L.A. Business is good, and they want to keep it that way," said Page. "We get that, but at the end of the day Skid Row isn't going anywhere." On the flip side, the general prohibitions on sweeping clean-ups have reverberated and infuriated people who live and work near Skid Row. Conditions on the street have worsened. The result is an area that might be mistaken for a third world slum in the shadow of downtown's government and financial core. 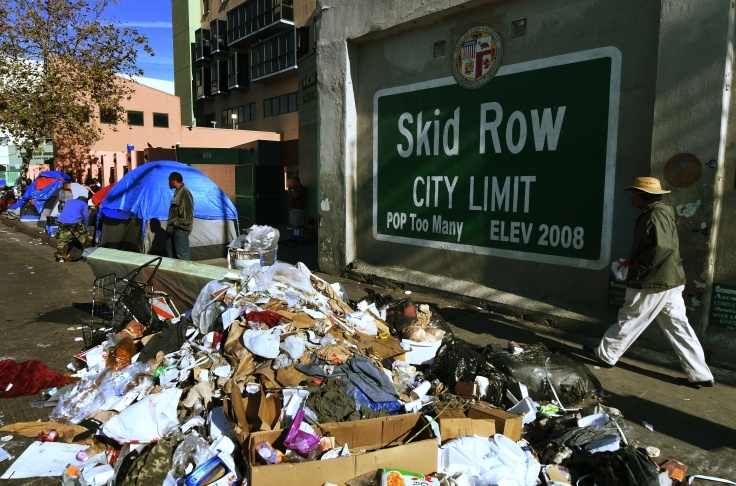 On October 3 — the day before the county health department announced the outbreak — more than 60 people packed an L.A. City Council committee meeting to urge the city to to clean up Skid Row. They were there to ask the city to not settle the Mitchell lawsuit. Their argument: making a deal could make the current conditions permanent. "It's getting very challenging to operate a business in this particular environment," said Mark Chatoff, owner of the L.A. Flower Mall and board chair of the Fashion District Business Improvement District, to the committee. "It's the wild wild west, and it's getting worse. Businesses will not survive with this constant combative threatening energy on the streets. It's simply not safe for anyone. If it continues, new investments will cease, and the streets will be a disaster." Page and others say that piles of garbage, vermin, and virtual absence places to go to the bathroom or wash up on Skid Row is inhumane. A 2017 audit on public bathrooms on Skid Row, for example, found that between 9 p.m. and 6 a.m., there were only nine available toilets for Skid Row's estimated 1,777 unsheltered residents. But Page says what passes for an encampment "cleanup" often does more harm than good for people trapped in a vicious and violent cycle of homelessness. In the Mitchell case, homeless residents sued L.A. specifically for seizing belongings like medication, cash, and identifying documents crucial to securing permanent housing. "It just perpetuates homelessness, which goes against what we ultimately want to do! You take all their stuff, of course they're stuck being homeless," he said. Greg Spiegel of the Inner City Law Center (and a former Mayor's office homelessness policy director) agrees with Page. He specifically emphasizes the difference between how the city approaches trash collection between its housed and unhoused residents. "Do you get a knock on your door at 6 in the morning with the message 'alright, get your garbage out, otherwise we're taking all of your crap.' No! We have an organized system where you know where you put your trash, when the trash collectors are coming, and how to sort it," said Spiegel. "It's organized because that's what works. We have a population that we don't provide enough housing for. But that doesn't mean we shouldn't provide regular, consistent, predictable trash service. This is totally solvable if everyone got around the table, would calm down and think about a long term plan." Spiegel specifically asks those in downtown to work with Skid Row advocates. "They're not people who we can just disappear. They're residents. The business sector needs to sit at the table and say 'these are residents of our community, how can we think of a long term strategy that serves their needs.' They have to build some trust, something they haven't done in the past. You can't just demonize people and hope they'll go away." Page has a similar message. "They make all of these laws telling how we can and can't live, but they don't listen to us, and they don't meet with us. It's highly insulting, and doesn't help solve the problem," he said. Instead of simply sweeping encampments away after they become health hazards, he says providing encampments with basic services like regular trash pickup and toilets can go a long way towards improving sanitary conditions on the street — both on and off Skid Row.